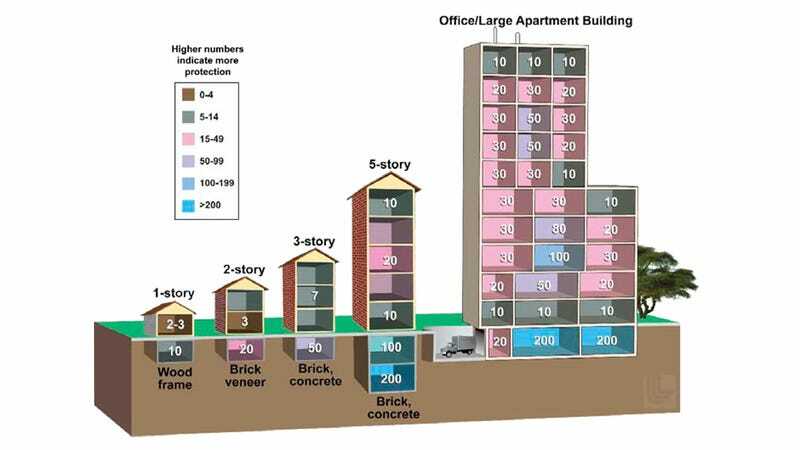 This image—found by Erika Engelhaupt—shows the best places to hide in case of a nuclear blast, part of a recent government guide about what to do in case of a nuclear detonation. It's scary to see that the US is still actively considering this risk. Take Michael B. Dillon, a scientist at the Lawrence Livermore National Laboratory. He just published the latest report on the subject, a research paper titled "Determining optimal fallout shelter times following a nuclear detonation." In the event of a single, low-yield nuclear detonation in a major urban area, rapidly providing adequate shelter to affected populations could save 10 000–100 000 individuals from a fatal exposure to fallout radiation. However, poorly sheltered individuals may remain at risk. Current guidance and prior studies are not consistent as to the timing and conditions under which poorly sheltered individuals should leave their shelters to evacuate or obtain better shelter. This study proposes methods to determine the optimal shelter time based on information potentially available following a nuclear detonation. For the case in which individuals move to an adequate shelter that can be reached within 15 min, individuals should stay in a poor-quality shelter for at most 30 min after the detonation. If adequate shelter is available nearby (within 5 min), then poorly sheltered individuals should immediately proceed to the better shelter. When I was a little kid back in the early 80s I was obsessed with nuclear war—I blame The Day After and War Games—and some nights I went to sleep thinking about what I would do if those ICBMs were ever launched. This could have been a good guide to have then—although I really wish it didn't exist in the first place. Of course, you have to ask yourself if you would like to survive a full nuclear war. It seems to me that it would be more useful to get a guide about what to do in case of a dirty nuclear bomb detonation.